Taurus et averso cedens Canis occidit astro. . .
As a result of the Precession of the Equinoxes, the Sun’s position at the Vernal Equinox shifts backwards through the Zodiac over the course of the centuries. If the current rate of change remains steady, it will complete a full circle in 25 786 years. Since this represents a passage of the Sun through the Zodiac, albeit backwards, it is taken by astrologers to be a kind of year, the Great Year, in which the Sun’s position in a constellation therefore represents a kind of astrological month, often referred to as an ‘Age’, lasting some 2 150 years. The period when the Vernal Equinox was in Taurus is therefore often called the Age of Taurus, when it was in Aries, the Age of Aries, and so on. These Ages are exactly the same as the periods of ‘two thousand and odd years’ (AV B 29) set out by Yeats in A Vision. The oldest list of marking stars that we have, the Babylonian Mul.Apin list (after 1000 BCE), starts with the asterism of the Pleiades (later included in the constellation of the Bull, Taurus) heading a list of 17 or 18 asterisms and constellations marking the ecliptic, and ends with Mul.Lu.Hun.Ga (the ‘Hired Man’, changed into the Ram by the Greeks). The figures of Taurus and Aries face in opposite directions, so as equinoctial point shifted from the Pleiades, in the shoulder of the Bull, it moved towards towards the tail of Aries and gradually towards its head. Ram facing in opposite directions. The Pleiades are situated in the shoulder of Taurus. 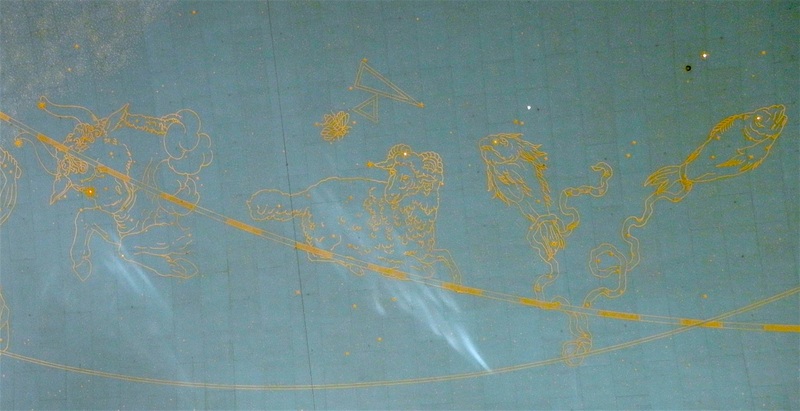 so the image is reversed here to show the constellations as they actually appear in the sky. In the 2nd century BCE, Hipparchus, who first noted the Precession of the Equinoxes, established the concept of the ‘first point of the sign of Aries’ defined by the equinox (see panel below). When astrology and astronomy were formalised and systematised in the Hellenistic culture of the Roman Empire, most notably by the Alexandrian Greek, Claudius Ptolemy (?85-?165 CE), the Sun’s position at the equinox was still at the border between the constellations of Aries and Pisces, and at around this date the Sidereal Zodiac of the stars and the Tropical Zodiac of the equinoxes coincided exactly. Gradually, however, they drifted apart again, so that the equinoctial point has now moved through Pisces to the border with Aquarius; however it is still called the First Point of Aries, by astronomers as well as astrologers, and taken as the start of the Equinoctial or Tropical Zodiac. 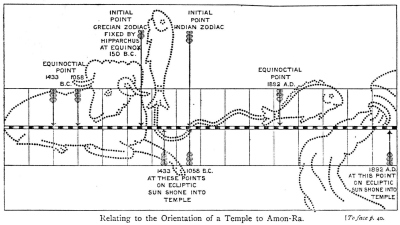 The historical equinoctial point, with particular reference to the Temple of Amon-Ra; from E. M. Plunket, Ancient Calendars and Constellations (YL 1596). This page was marked in Yeats’s copy, disputing the dates: next to the line ‘Initial Point Grecian Zodiac Fixed by Hipparchus at Equinox 150 B.C.’, Yeats wrote ‘No – number / understand that place of equinox / 150 A. D. not initial point’. This implies that Yeats understood that this was the position of the Equinox or tropical ‘First Point of Aries’ rather than the start of the constellation of Aries and in 150 A.D. rather than B.C. Although ‘ìnitial point’ would generally indicate the First Point of Aries, Yeats is probably disputing the date of when the Tropical and Sidereal Zodiacs coincided. This is usually considered to be after 200 AD/CE and ‘Lahiri's ayanamsa’, the most widely used in India, puts it at 285 CE. Indian astrology continued to use the Zodiac of the stars, while Hellenistic and Perso-Arabian astrology used the Zodiac of the equinoxes. Western astrology follows this latter tradition of the Tropical Zodiac, so that the Sun is said to be ‘in Aries’ for the thirty days that follow the Vernal Equinox, even though its apparent position with respect to the stars is then aligned with the constellation of Pisces. A child who is born during these thirty days is said to have the Sun in Aries, and its character will be represented accordingly. Someone observing the sky at this period would however find that the stars blotted out by the Sun’s brightness were in the constellations of Pisces and Aquarius. In the case of the child, the Sun’s apparent position with respect to the constellations is not held to be important. However, within the larger scheme of the Great Year, the Vernal Equinox’s position in Pisces is said to bring a Piscean influence to bear upon the whole world, which passes through the ‘Age of Pisces’. Helena Blavatsky, ‘The Esoteric Character of the Gospels: Part 1,’ Lucifer 1:174, note 5. William Quan Judge, The Ocean of Theosophy (NY & London: The Path & Theosophical Publishing Society, 1893), 121. As the equinox is approaching Aquarius, this has given rise to the idea of ‘the dawning of the Age of Aquarius’ (as in the song from the musical, Hair), and the word ‘Aquarian’ is sometimes used as a synonym of ‘New Age’ (itself a vague enough term) with respect to ‘alternative culture’, in particular spirituality outside traditional religious systems. Though the idea entered popular culture only at the end of the twentieth century, it was widely discussed in esoteric circles much earlier. In 1896 George Russell (AE) wrote to Yeats, for instance, that ‘I agree with you that we belong to the coming cycle. The sun passes from Pisces into Aquarius in a few years. Pisces is phallic in its influence. The waterman is spiritual so the inward turning souls will catch the first rays of the New Aeon’ (CL 2, 7n, [February 1896]; Yeats’s letter is lost). There is no exact date for transitions, since the borders between the constellations are naturally vague, although when applied to the Sidereal Zodiac they are regularised to 30° each and boundaries are clearer. Those who take the 30° segments as the boundaries consider that the age is dawning now. Those who take the constellations as the reference frame see the transition as some way off, since the constellation of Pisces is significantly longer than 30° (see right); the date for the transition to the constellation of Aquarius is sometimes given as late as 2600CE. That the birth of Christ took place at the transition not just from Aries to Pisces but from the first sign of the Zodiac to the twelfth, therefore starting a new cycle, is no accident in this system. It regards the rise of monotheistic religions with universal scope as a phenomenon of the new Age of Pisces, and the universal Christian church as the primary manifestation of the epoch. Similarly, the dating of the eras from the computed birth of Christ is regarded as humanity synchronising its calendar with the Ages. 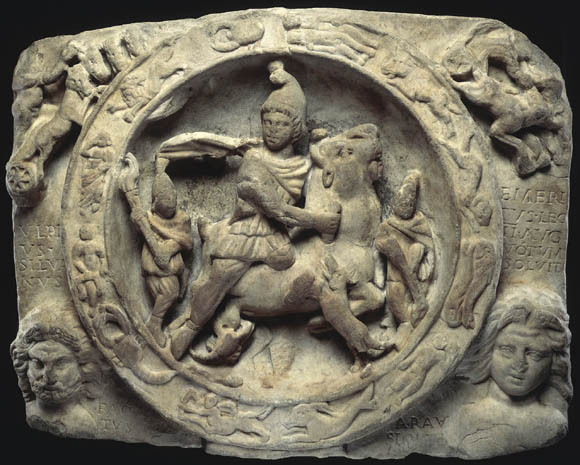 Mithras slaying the bull, surrounded by the zodiac. Relief discovered in Walbrook in the City of London in 1889. The full Mithraeum in London was excavated in the 1950s. Ironically, perhaps, the notion of the precession giving rise to ‘ages’ appears to originate in Enlightenment scepticism and anti-religious writers, who traced the iconography of religions to the stars and saw changes of cultic imagery mirroring in particular the constellation of the Vernal Equinox in the northern hemisphere. Charles Dupuis, Origine des tous les cultes , ou, Réligion universelle (Paris: H. Agasse, 1795). C. F. Volney (C. F. Chasseboeuf Boisgirais), Ruines, ou Méditations sur les révolutions des empires (Paris: Desenne, 1791). Thomas Jefferson translated the bulk of this so-called "Paris translation", while Vice President, but it was finished by Joel Barlow and published with Barlow's name associated. CYGNUS, the Swan.--An old constellation in the milky-way, between Equus and the Dragon. This is fabled to be the swan into which Jupiter transformed himself in order to deceive the virtuous Leda, wife of Tyndareus, king of Sparta. The Grecian matron, like the Jewish virgin, thus became the mother of a God. Appendix to 1890 English translation of Volney's Ruins (Jefferson/Barlow translation). The appendix is announced to be ‘Compiled by the publisher [Peter Eckler] from recognized authorities’. For a recent consideration, in a somewhat different context, see, for example, J. Z. Buchwald and D. Greco Josefowicz, The Zodiac of Paris (Princeton: Princeton University Press, 2010), esp. chs 2 and 3. The equinox that is marked by the Sun’s passage northward across the equator in March and fixes the First Point of Aries is generally referred to as the Spring or Vernal Equinox. However, properly speaking this only applies to the northern hemisphere. For the southern hemisphere this equinox marks the onset of fall or autumn and is their Autumnal Equinox. Conversely September’s equinox, when the Sun is passing southwards over the equator and fixing the beginning of tropical Libra, is the Vernal or Spring Equinox in the southern hemisphere and the Autumnal Equinox in the northern. Each equinox is therefore vernal for half of the globe. Therefore when the northern hemisphere’s Vernal Equinox takes place in the constellation of Pisces in March, the corresponding southern Vernal Equinox takes place in the constellation of Virgo in September. Each Age therefore unites the two opposite signs, and should be called the Age of Taurus-Scorpio, Aries-Libra, Pisces-Virgo and Aquarius-Leo. Opposite signs are often considered to share many underlying traits, those of the first six signs (Aries to Virgo) being directed inwards to personal or selfish ends and their counterparts in the last six signs (Libra to Pisces) being directed outwards to social or external ends. (The Mundane Houses are similarly patterned.) For example, Virgo and Pisces have in common a concept of service and a degree of self-abnegation, but the service of Virgo is represented by Martha, dutiful and efficient, while that of Pisces is represented by Mary, emotional and extravagant. Therefore, although there may be some conflict in the polarity, there is also an underlying common ground. The following attributions are given as those generally cited to illustrate the Astrological Ages, and are somewhat selective and anecdotal in their application. Migrations of people are certainly debated with regard to date and routes, and the dates for changes and innovations also show plenty of variation and disagreement. The dates of the ages given here are based upon twelve equal divisions of the precessional cycle, taken as 26 000 years, with the Age of Pisces starting with the Common Era, the date of Jesus Christ’s birth as calculated in the sixth century by Dionysius Exiguus. This arrangement follows Julia and Derek Parker, The Compleat Astrologer (1971), 44-45 (cf. Parkers' Astrology , 24-25, and see also Nicholas Campion, The Practical Astrologer [1987/1993], 142), but allotting a full 2,150 years to each period, rather than the rounded 2,000 the Parkers use. ca. 15150 BCE-13000 BCE Lascaux cave paintings. Arrival of humans in America across Bering land bridge. ca. 13000 BCE-10750 BCE End of last Ice Age. Clay Pottery. First intensive hunter-gatherer culture. First agriculture in Near East. ca. 10750 BCE-8600 BCE Stone age. First towns (Jericho). ca. 8600 BCE-6450 BCE Copper first used. Alcoholic fermentation discovered. Mother goddesses. ca. 6450 BCE-4300 BCE Start of writing systems and accounting. Increased trade. ca. 4300 BCE-2150 BCE Rise of Mesopotamian and Egyptian civilisations. Bronze age in Greece, rise of Minoan and Mycenean cultures. Consolidation of agriculture, building of pyramids and megaliths. Bull cults in Assyria, Egypt, Crete. ca. 2150 BCE-1 CE Bronze age in Central Europe. Arrival of Dorians in Greece. Rise of Classical Greece and Rome. Abraham’s sacrifice of Ram; Mosaic Judaism. Iron age. Life of Gautama Buddha. ca. 1 CE-2150 CE Life of Christ, symbolised by the fish, with fishermen disciples etc. Decline of Roman Empire. Life of Mohammed. Age of Monotheism. Universalism and the rise of global structures. 2150 CE-4300 CE Communications and travel innovations. Humanitarianism. Yeats’s alternating antithetical and primary religious ages of some 2,200 years are identical with the astrologers’ and he evidently expected his ‘old fellow students’ (A Vision A xii) in the Theosophical Society and Golden Dawn to see the connection. 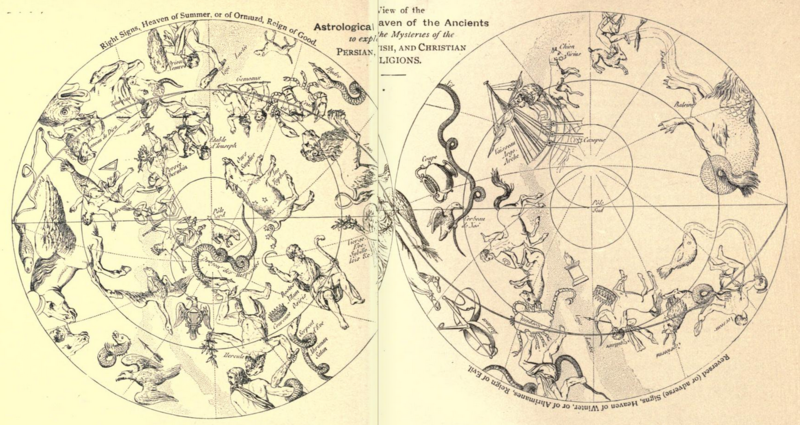 The first version of A Vision (A Vision A) expects readers to cope with unexplained astrological symbols and points about precession that are relatively straightforward to anyone with an astrological background but baffling otherwise. A Vision B is slightly more helpful, giving a whole book to "The Great Year of the Ancients", but gives more space to analogues, authorities and allusions than to clear explanation. Yeats also complicates the picture slightly by adding a syncopated cycle of epochs of civilisation of the same length (2,200 odd years) which starts at exactly the middle of the corresponding religious age. He equates these with Lunar Months which start symbolically at the Full Moon which falls the middle of a Solar Month: "The Lunar Months of 2200 years apiece, in a year of 26,000 years, are years of civilisation, while the Solar Months of a similar symbolical length correspond to periods of religion" (AV B 203). In the Wheel to the right, the red line from the circle’s centre to the edge represents the Vernal Equinox, placed for the current time. The signs at the centre represent the Sidereal Zodiac and are placed clockwise on the wheel, the Solar direction. The next circle shows the Phases of the Lunar month divided according to Yeats’s twelvefold division, which are placed anti-clockwise, the Lunar direction. The date when the Equinox was placed in a particular Sign of the Zodiac, and in Yeats’s corresponding Lunar division, is indicated in the next ring. The outer ring gives names of the "Ages" according to astrology, as in the table above. The Equinox’s red arrow can be imagined either as the hand of a clock, moving anti-clockwise and completing a circle in 26,000 years, or as a fixed pointer, while the disc of the wheel shifts slowly clockwise once every 26,000 years. In Yeats’s use of the Precession, the Solar ages remain the same as those of ‘conventional’ astrology, but are applied to the gyre of religion only. These are counterbalanced by the opposing Lunar gyre of civilisation (see Historic Cycles). Since the Solar Zodiac remains the measure of the religious cycles, the Solar gyre or cone remains the religious gyre whether the dispensation is primary or antithetical and the Lunar divisions mark the gyre of civilisation, whether it is primary or antithetical. In effect, the signs of the Zodiac that are traditionally denominated feminine or negative (Taurus, Cancer, Virgo, Scorpio, Capricorn, Pisces) are associated with primary dispensations, and the masculine or positive signs of the Zodiac (Aries, Gemini, Leo, Libra, Sagittarius, Aquarius) are associated with antithetical dispensations. Since the civilisation is seen to arise from the dispensation, Yeats effectively also gives primacy to the Solar, religious gyre. It is clear from his (limited) comments about the ages of civilisation in pre-history in A Vision (AV B 205) that, when writing about his own System, Yeats was thinking of as much in terms of the ‘conventional’ astrological "Ages", as in terms of archaeology and pre-history. When I relate this symbol to reality various fancies pass before the mind. The Great Wheel revolved innumerable times before the beast changed into man and many times before the man learned to till the ground. Perhaps the hunting age gave way to agriculture when our present revolution brought round Phase 4 or 5. At Phase 4 or 5 or perhaps a little later may have emerged the Sacred Legend of the sun’s annual journey, symbol of all history and of individual life, foundation of all the earliest civilisations; and at the phases where Unity of Being became possible began perhaps those civilisations, Egypt or Sumer, which had made a progressive, conscious, intellectual life possible by the discovery of writing. The ‘Sacred Legend of the sun’s journey’ should probably be associated with the Solar gyre of religion rather than the Lunar gyre (measured by the Phases), but seems anyway to derive from the fact that Leo is the sign of the Zodiac associated with the Sun. The phrase ‘the phases where Unity of Being became possible’ is not particularly helpful, since it usually refers to Phases 16, 17 and 18, but may here mean the establishment of the antithetical half of the Wheel at Phase 9 or the opening of the Tinctures around Phase 11, since Unity of Being is the antithetical form of perfection. Yeats, however, deliberately keeps the ideas in the realms of ‘symbol’ rather than reality and ‘fancies’ rather than theories: ‘what of those [circuits of sun and moon] that are fixed, like a butterfly upon a pin, to our central date, the first day of our Era, divide actual history into periods of equal length. To such a question I can but answer that if sometimes. . . I have taken such periods literally, my reason has soon recovered. . . ’ (‘A Packet for Ezra Pound’, AV B 24-25). Plate showing the "Astrological Heaven of the Ancients to explain the Mysteries of the Persian, Jewish, and Christian Religions" from Volney's Ruins, or Meditation on the Revolutions of Empires (see above). The essays "'Timeless and Spaceless'?" by Matthew Gibson and "W. B. Yeats's A Vision: 'Dove or Swan'," by Matthew DeForrest in the collection W. B. Yeats's "A Vision": Explications and Contexts, edited by Neil Mann, Matthew Gibson, and Claire Nally (Clemson University, 2012) provide useful further consideration of the ideas here.